for my blog, i mean. it's a new year, so why not a fresh start, right? i just want to re-design things and make my blog more interactive, as in more giveaways and contests, swaps, that sort of thing. i think it would be a great way to get to know all you. 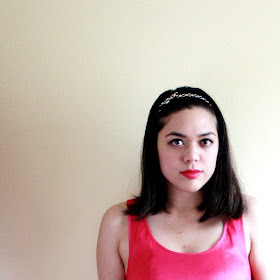 i want to be more involved in the blogging community, and now that school's over, i can. i'm working on hosting a new giveaway right now. more details to come later! and i've been a bit lazy with the outfit thing. staying at home and having nowhere to go is a bit uninspiring. maybe i should work on fashionable lounge-y/stay-at-home/bumming around outfits? haha. it's a thought. a huge thanks to shirley for featuring me on her top 100 favorite bloggers. be sure and check out her blog. she's very sweet + always has interesting posts and fun photos! just make sure this year is amazing. new hair accessories for sale on etsy!